What’s the most accurate way to determine the carbon content of the flyash? 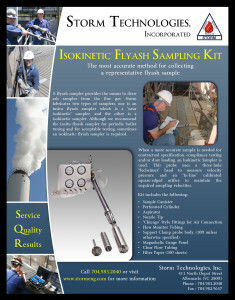 A flyash sampler provides the means to draw ash samples from the flue gas. Storm fabricates two types of samplers, one is an In-Situ Flyash Sampler which is a “Near Isokinetic” sampler, and the other is a Isokinetic Sampler. Although we recommend the In-Situ Flyash Sampler for boiler tuning and periodic testing, sometimes an Isokinetic Flyash Sampler is required. When a more accurate sample is needed for contractual specification, compliance testing, and/or dust loading, an Isokinetic Sampler is used. 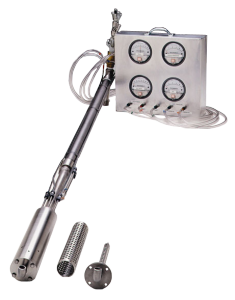 This probe uses a three-hole “Fecheimer” head to measure velocity pressure and an “in-line” calibrated square-edged orifice to maintain the required sampling velocities.